Ready to get your finances in order? Join our Financial Fitness Bootcamp sponsored by Finaeo on January 27th to tackle those holiday bills and start your year right. Get your ticket now. 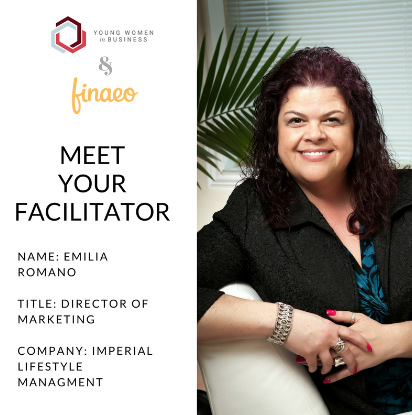 YWiB Toronto sat down with Emilia to learn more about how she got her start in the financial field, and what she thinks young women today need to know. 1. How and why did you get involved in financial literacy? I got involved in financial literacy via my first job out of college with Financial Concept Group. Although my degree and background are marketing related, it led to a great understanding of the need for education in all thing finance and the importance it plays in our lives starting a very early age. 2. Do you think most young people (women specifically) today have a good grasp of financial literacy? Sadly, I do not and have often wondered why these tools are not taught in elementary school and beyond. The fear surrounding financial literacy needs to be removed and understood as soon as possible for young people but especially young women who are still sometimes taught to be reliant on the "man" to take care of their finances. Every young person today, regardless of gender but especially young women need to understand, practice, and implement good long-term financial goals and know how your purchasing decisions can affect those goals today and beyond. 3. What is a personal lesson you learned about financial saving or investing that you want to pass onto our audience? Start early to save and pay yourself first... always have a safety net in place for the unexpected. Do not think "it will not happen to me" - be prepared for any possible situation and have the peace of mind of knowing you are going to be ok because you were/are prepared. Really think about the purchase: is it necessary? Do I need it today if I have the cash to buy right now?! 4. Anything else you want to tell us about financial literacy? Do not be afraid of this subject: ask questions, get informed, ask various sources, and don't put all your eggs in one basket! If you have a mentor that you look up to and they are successful - let them teach you their ways! Discuss this with your friends and peers! !